Fettling spheroidal carbon steel castings. The company operates a foundry that casts components in spheroidal carbon steels. These materials are very hard and, as a result, fettling (the removal of excess material after casting) has to be done with high-performance tools. People working in the fettling area can be exposed to grinder vibration for up to 3.5 hours a day. The large high-frequency electric grinders used at the factory can produce vibration magnitudes of more than 7 m/s2, so it is possible that people doing this work received a vibration exposure above the exposure limit value of 5 m/s2 A(8). Much of the fettling is now done with a fully-automated robot-based machine. The castings are mounted on special fixtures and placed onto a conveyor system. 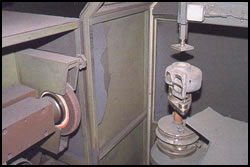 A robot arm then picks up the fixture and manipulates the casting so that the unwanted material is removed by large grinding and cut-off wheels. The control sequences are pre-programmed, so all the operator has to do is mount the castings onto the fixtures. There is improved productivity and more consistent quality. There is reduced exposure to noise, dust and fumes.